I've used Seat Concepts seat kits on several dual sport bikes over the years and they are must-have upgrade if you're like me and can't sit on the stock seat for more than about 50 miles. On our Honda CRF250L I went with the Seat Concepts seat shown above, in the Standard Foam Height version, and the All Carbon cover material. The Seat Concepts seat for the CRF250L is about 9 1/2" at its widest point, compared to about 7 1/2" for the stock seat (see photo above, bottom left). It also has slightly softer foam than the stock seat. The combination of softer foam and wider seating surface make it really comfortable, especially on longer rides where the narrow and firm stock seat just doesn't cut it. I've done several 250+ mile days on Seat Concepts seats and they are a HUGE improvement over pretty much any stock seat. Additionally, if you go with the Low Foam option, which is about an inch lower than stock, the lower seat height will give you more confidence when riding off road, and even on the street when pulling up to stop signs and stop lights. The All Carbon Cover shown on our bike is a black vinyl that has a carbon fiber pattern made into the surface for a good look. There is a texture that acts like a very light gripper material and it's easy to move around on the seat. Your other option would be the Black Gripper/Carbon cover, which has a gripper material on top of seat and the carbon vinyl material on the sides. It's great for aggressive riding and when you want to be held in place. If you like to slide around, it might not be the best choice and I'd recommend the All Carbon cover. The Standard Height Foam version we have on our bike is about the same height as stock, but about 2" wider than stock at its widest point. The lowest point of the seat is raised 1/2 inch to help the slope into the tank. The other option available is the Low Height foam, which is about 1" lower than stock, and still features the wider seating surface. The kit includes seat cover and replacement foam. It DOES NOT include the seat pan. Most people will use their stock seat pan, and install the Seat Concepts foam and seat cover on it. Installation instructions are included. 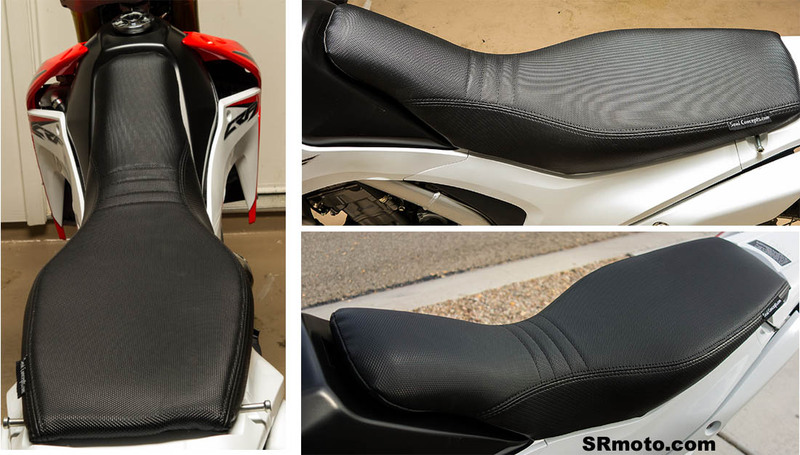 If you're looking for a more comfortable seat for your new Honda, and want to do longer rides without having to stop and take a break, the Seat Concepts seat kit is exactly what you're looking for. The seat is wider than the stock seat, which gives you a larger surface to sit on, making it very comfortable. The foam is also slightly softer than the very firm stock seat. This is definitely one of the best modifications you can do to your new bike.